Last Friday and Saturday were very hot and humid. I made my regular lunch on Friday… roti, sabji, dal and chaas, but didn’t feel like having that. So opened to the fridge to make a smoothie but got some yogurt and cucumber in my hand instead. So the smoothie was side lined for a yummy raita. I prefer the banana cucumber raita but didn’t have bananas. So I made it with pomegranate and cucumber. It was a cooling and filling treat. Suddenly the weather took a turn on Sunday and its been raining till now. Watching the rains from my window is fine but getting out is yucky! Today, I had to go out to do some veggie and fruit shopping, got wet and feet were dirty. Why don’t we dress up according to the weather in the tropical countries? In the western country umbrellas, raincoats, rain boots, slacks etc comes out whereas I have noticed in Kenya and India, we still wear open sandals, carry a mini umbrella and that’s it. Seriously these umbrellas offer no protection especially if its windy. Yesterday, I carried one of those huge umbrellas while going to Nakumatt our local supermarket. I just have to cross the main street from my apartment and we are there. On a normal sunny day, that’s not a problem but during the rains its a different story altogether. Firstly, the matatus (our public transport vans with ruthless drivers) have no qualms about splashing you with the murky rainwater. I get the feeling they purposely go into the puddles to trouble the pedestrians. Then the pavements are filled with mud and sand making it difficult to walk without slipping. Ah yes coming to the huge umbrellas, everyone carries one so you actually land up hitting each other with it. Someone has to give way and in the process get even more wet. So will I be walking out next time in a raincoat in Mombasa, not really as I don’t own one. I will just avoid getting out in the rain as much as I can. In the meantime enjoy the raita recipe. If the peel of the cucumber is thin and nice, then grate the cucumber with it. No need to peel it. I got about ½ cup grated cucumber. Chill the raita for 1-2 hours and serve. I prefer to use thick yogurt. If its homemade yogurt, place it in a muslin cloth to drain out the excess water. Very refreshing and beautiful raita..looks too good. 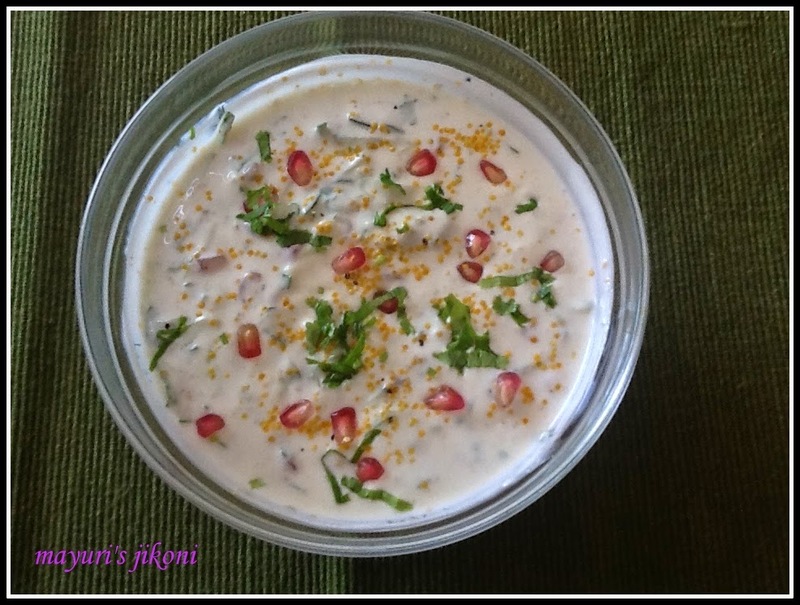 Very interesting raita combo – cucumber and pomegranate. Loved it! I simply love raita but never added pomegranate. Thanks and next round, it will be added.